Author with Big Door County Smallie. We've waited a long time for spring this year in Wisconsin, but the wait has been worth it. I'm ready to hit the open water in one of my Wilderness Systems kayaks to chase smallmouth and largemouth bass. 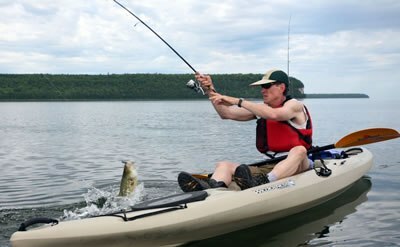 The great thing about kayaks, and living in Wisconsin, is we have so many great fishing options. When I give my Door County and River Smallie talks, I make a point of discussing the importance and fun of exploring, whether in a kayak, waders or powered boat. Exploring may be the best part of your day on any body of water, and it's hard to beat exploring in a kayak. Pull out the Wisconsin Gazetteer or get on-line with Google Maps and begin your exploring adventures, you won't be disappointed. Doing more exploring in my kayak is on my list of things to do this year, and years to come. Let me tell you some of the locations on my kayak fishing wish list. Near the top is our "other" Great Lake, Lake Winnebago. Known as a tremendous walleye fishery, the bass fishing is getting better every year. I plan to hit the west shoreline from Oshkosh to Neenah looking for smallies, as well as largemouth in shallow. My kayak fishing friends say making the drive will be well worth it for a great day on the water, and there are numerous great places to launch. I spend many days in Door County chasing those fat smallies, but how about those harbors in Kenosha, Racine, Milwaukee, Port Washington and Sheboygan? They all are treasure chests of big salmon and trout. Just ask Dan Dalton, Ocean Kayak Pro, who spends a great deal of his fishing time in the southeast Wisconsin harbors where he won an all-comers tournament a few years ago with a 25 pound king salmon. I've been on the Menomonee, Peshtigo and Oconto Rivers in NE Wisconsin, but not in my kayak. The beauty and great smallie fishing is calling me back. And, along all three rivers there are numerous great places to launch. Rivers are a good place to go with a friend with a second vehicle to make the trip easier, leaving one at your takeout location. If you're alone there's usually someone locally, who, for a few dollars, will help you drop your vehicle at your take out point. I've done this a number of times. In neighboring Minnesota, the Boundary Waters are special, but closer to home for most of us is the Sylvania National Forest in Michigan, just across our northeast Wisconsin border. To the northwest is the St. Croix River, our border with Minnesota. I've had great smallie outings north and south of Hudson, but want to head back with the kayak. With the kayak I want to head farther north where the river offers even more beauty and fishing action. I can't wait. For those of us in southern Wisconsin, there are some outstanding rivers that hold nice numbers of smallies. In southwest Wisconsin it's tough to beat the serenity of the Platte and Grant Rivers. These are a little more remote, winding through the hills and fields of farm country, but it's beautiful and productive. Over the past few years I'm seeing more and more eagles while fishing these rivers. South of Madison is Sugar River, with some nice smallie numbers. The Milwaukee River in southeast Wisconsin from above West Bend to just north of downtown Milwaukee is worth fishing. It's pretty shallow in areas, but you can just pull your kayak through those spots. Not on my "wish" list, because I'm in Door County quite a few days in May and June, but fishing more from one of my kayaks is on the list. There is great smallmouth bass fishing from the bays west of Sturgeon Bay all the way to the end of the peninsula and on Washington Island. What an incredible combination of unsurpassed beauty and great fishing. There are numerous locations to launch a kayak at the state parks, town launches and the many small roads that end at the water. An exploring discussion wouldn't be complete without talking about the ponds and small lakes that dot every corner of our state. These are ideal for the kayak angler who can get on water that powered boat anglers can only dream of. If you think the access to a pond or small lake is private, be sure to ask permission. I always add that I'm a catch and release angler. If you're new to kayak fishing and set with your equipment, great, but if not, let me give you a few tips. Sit-on-tops, like the Wilderness Systems Tarpon are my favorites. If you are a fly fisherman, you might want to consider the Wilderness Systems Ride or Commander. Both have a pontoon hull for even more stability and are designed with standing as a feature for fly fishing or sight fishing. If you prefer a sit-in kayak, get one with a big cockpit to facilitate casting, like the Wilderness Systems Pungo. For lakes you probably should look at lengths in the 12 to 16-foot length, and for rivers 10 to 12-foot range for a little easier maneuverability. Rudders aren't necessary, but I love them. On windy days the rudder, which is operated with foot pedals, is a nice bonus. It lets you continue paddling normally, keeping you on a straight track rather than adding multiple strokes on one side to track straight. The right paddle and paddle length is something many kayakers do not give enough consideration to. I recommend buying the lightest paddle you can afford. Added arm fatigue from a heavy paddle can dampen an otherwise great outing. Paddle length is a key consideration. Most paddle companies have formulas on their web site so you pick the right length. Be sure to consider whether you are a vertical or horizontal paddler. A vertical paddler will dig in the water with a more vertical stroke, which might point to a slightly shorter paddle. A horizontal paddler is a kayaker who may be moving slower and more leisurely. This type of paddler has strokes that aren't as deep and are a little further from the kayak, pointing to a slightly longer paddle. Most kayak angler will be using a paddle from 220 centimeters to 240 centimeters. Also, many kayak anglers like paddles with an oversized blade to push more water and move faster from one fishing spot to another. Check out the web sites for Adventure Technology Paddles and Wisconsin company, Bending Branches/Aqua Bound. Kayak fishing is becoming more and more popular. I don't think you'll be disappointed if you give it a try. If you have any questions, please feel free to email me.